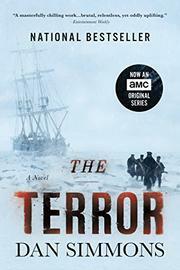 Horror novel based on an ill-fated 19th-century polar expedition. Simmons (Olympos, 2005, etc.) tells the story through the eyes of several characters, including the expedition’s leader, Sir John Franklin, co-commander Captain Francis Crozier and the ship’s surgeon Harry Goodsir. The author jumbles the chronological sequence, beginning in October 1847 with Terror (one of the expedition’s two ships; the other was Erebus) trapped in the ice north of Canada, where they have come in search of the Northwest Passage. The initial scene immediately introduces the novel’s main supernatural element: a giant bear-like entity (the crew call it the thing) that preys on the explorers and appears invulnerable to their weapons. The expedition is in enough trouble without this hostile being’s attention. Food is short, thanks in part to improperly prepared canned goods; the ships have been frozen in thick sea ice for two consecutive winters; many of the crew show signs of scurvy; and temperatures have been consistently 50 or more degrees below zero. Overconfident Franklin has disobeyed orders to leave behind messages detailing his movements, so rescue expeditions have no idea where to search for him. Crozier, for his part, is a chronic drunk, although it doesn’t seem to affect his command of his ship and men. Simmons convincingly renders both period details and the nuts and bolts of polar exploration as his narrative moves back and forth in time to show the expedition’s launch in 1845 and its early days in the Arctic. Tension builds as the men struggle to survive: The thing is a constant menace, and deaths continue to mount as a result of brutal Arctic conditions. The supernatural element helps resolve the plot in a surprising yet highly effective manner.